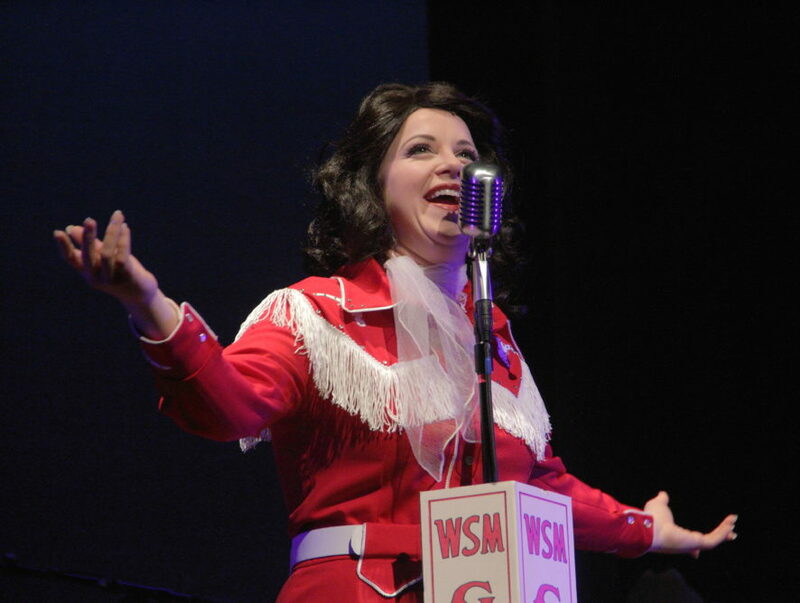 “She has so many hits,” says actress Sandia Ahlers with a laugh, referring to Patsy Cline, the music legend that she’s portraying in the musical play that opens the landmark 40th season of the Virginia Stage Company, Always…Patsy Cline. 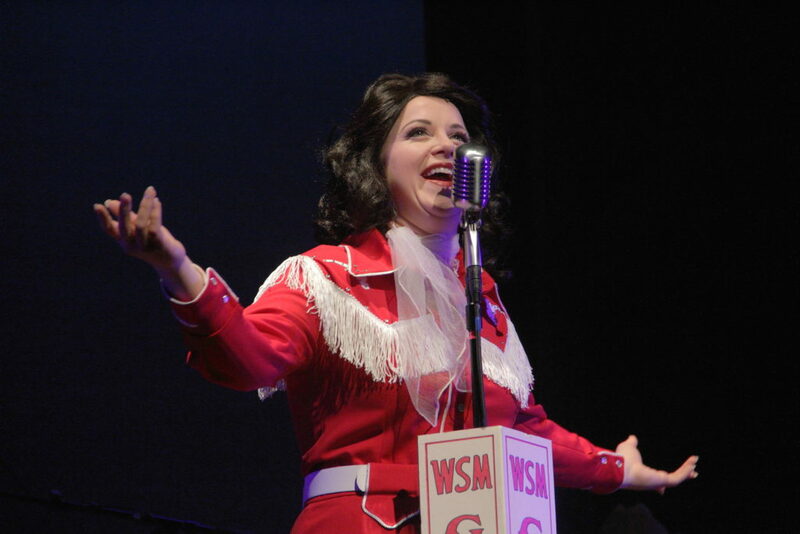 The actress is new to VSC, but is certainly not new to portraying Patsy, as she portrayed the country music icon in the national tour of A Closer Walk with Patsy Cline, the other estate-sanctioned show. It’s a Thursday evening at the Wells Theatre, and Sandia is sitting across from actress Linda Edwards, who plays Louise Seger in the show. They have just wrapped a full day of rehearsal, and are both looking forward to the start of previews in just a couple of weeks. Linda last performed in a VSC production back in 1993, starring as Prudie in Pump Boys & Dinettes, which was directed by her brother, the late Jason Edwards, an actor/director who was well known for Ring of Fire: The Music of Johnny Cash. Linda herself has portrayed Patsy in previous productions of this show, which was actually previously mounted at VSC many seasons ago. Amy Jones is unable to join us tonight, but she’s returning this season to direct Always…Patsy Cline, following her stint also directing last season’s opening production. It becomes clear early on that both Sandia and Linda were perfectly cast for their respective roles, as they both possess these big personalities that are highly engaging. Linda’s southern accent seems perfect for the Houston, Texas bred Louise, while Sandia has mastered Patsy’s famous smoky voice. “I fell in love with her when I first had the opportunity to bring her to life,” says Sandia, referencing her previously lauded work as Patsy. There are close to 30 songs performed in this Ted Swindley created show, covering much of the Winchester, Virginia native’s catalogue of hits, including country music staples like “Crazy,” “I Fall to Pieces,” and “Walkin’ After Midnight.” Much of the play, which Louise narrates, takes place at Nashville’s Grand Ole Opry, where Patsy Cline is belting out hits while backed by a six piece band. 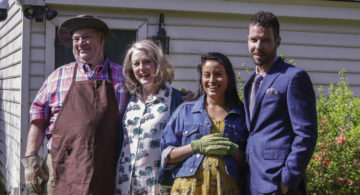 Then there’s also Louise’s kitchen in Houston, where she details her unlikely friendship with the music superstar. Though it’s certainly a challenge, Sandia has enjoyed learning how to sing these songs the exact way that Patsy sang them. 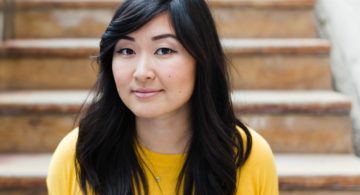 “It’s an interesting approach to try to really let go of all of those performance techniques that you might have been taught as a contemporary performer, and really try to honor the mic,” she says. “She really just felt these songs when she was singing them.” Indeed Patsy’s voice is legendary for evoking so much emotion, especially melancholy. And her tragic death from a plane crash, at the extremely young age of 30, has only added to her legend. “She was very different from the country music females of the time, like Kitty Wells and Loretta Lynn, because she looked classy,” says Linda, meaning that Patsy’s style became more decidedly glamorous, especially as she continued to gain crossover success onto the pop charts. The character of Louise is based upon a real life fan that Patsy developed a pen-pal relationship with. “They click in the show, because Patsy just saw a kindred spirit,” says Linda. “Louise is just out there. She has no filter. She has no problem letting you know that she loves you…she’s very Texas.” The audience sees everything through Louise’s perspective, throughout the two act production. Her Texan humor and related wit adds comedic balance to the concert driven portion that we experience from Patsy. It’s the character of Louise, in particular, who makes it a very fun show.